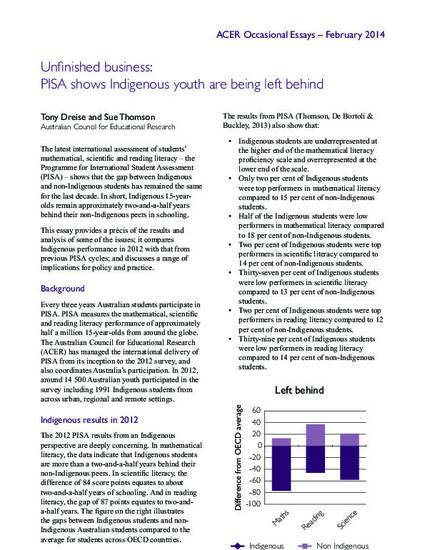 The latest international assessment of students’ mathematical, scientific and reading literacy – the Programme for International Student Assessment (PISA) – shows that the gap between Indigenous and non-Indigenous students has remained the same for the last decade. In short, Indigenous 15-yearolds remain approximately two-and-a-half years behind their non-Indigenous peers in schooling. This essay provides a précis of the results and analysis of some of the issues; it compares Indigenous performance in 2012 with that from previous PISA cycles; and discusses a range of implications for policy and practice.